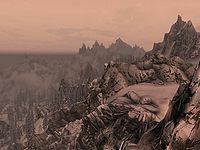 The Jerall Mountains are a mountain range that stretches along the southern border of Skyrim. The mountains form the southern border of Falkreath Hold and the Rift. Its harsh, cold climate has made the mountains nearly inhospitable, with few inhabitants living there and no major settlements throughout history. Some points of interest include the town of Helgen, Fort Neugrad, Bloodlet Throne, the dragon shrines of Ancient's Ascent and Lost Tongue Overlook, the Dwemer ruins of Rkund, or the large Nordic ruin of Arcwind Point. This page was last modified on 6 December 2014, at 15:00.